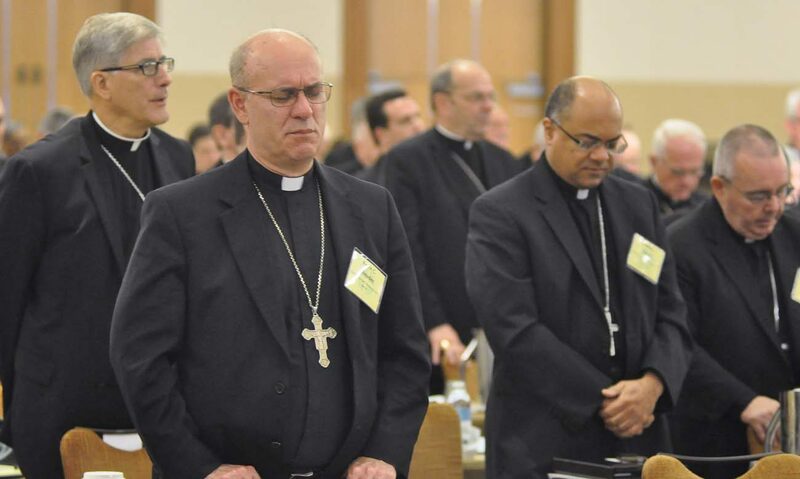 INDIANAPOLIS (CNS) — Reflecting their concern that religious liberty at home and abroad remains a top priority, the U.S. bishops during their spring general assembly in Indianapolis voted to make permanent their Ad Hoc Committee for Religious Liberty. Voting 132-53 with five abstentions June 15, the second day of the assembly, the bishops’ action came less than a week before the start of the U.S. Conference of Catholic Bishops’ fifth annual Fortnight for Freedom June 21-July 4. The observance is a two-week period of prayer, advocacy and education on religious freedom. The bishops also heard reports from the chairman of the Committee on International Justice and Peace about international persecution and human rights violations; final plans for the July 1-4 “Convocation of Catholic Leaders: The Joy of the Gospel in America” in Orlando, Florida; and the progress of a working group on migrants and refugees. Before the vote on making the Committee on Religious Liberty permanent, Baltimore Archbishop William E. Lori, committee chairman, said the need for the body stretches beyond the specific legal and public policy issues challenging religious freedom that continue to emerge. The USCCB reinforced its stand that the American Health Care Act passed by the House of Representatives May 4 needs major reform — to provide quality health care for the “voiceless,” especially children, the elderly, the poor, immigrants and the seriously ill.
His comments followed a report on health care reform by Bishop Frank J. Dewane of Venice, Florida, chairman of the USCCB’s Committee on Domestic Justice and Human Development. Bishop Dewane focused on the Senate’s work to repeal and replace the Affordable Care Act. Meanwhile, the bishops’ working group on migrants and refugees was set to complete its work by the spring assembly, but Cardinal Daniel N. DiNardo of Galveston-Houston, USCCB president, announced June 15 he was extending the group “recognizing the continued urgency” so many migration and refugee issues present. Archbishop Jose H. Gomez of Los Angeles, USCCB vice president and the group’s chairman, and Bishop Joe S. Vasquez of Austin, Texas, chairman of the USCCB Committee on Migration, outlined the working group’s origins, activities and next steps on issues. Francesco Cesareo, chairman of the National Review Board, urged the bishops June 14 to continue their commitment to stopping clergy sexual abuse and supporting victims of abuse “at the forefront” of their ministry. He said sexual abuse of minors by clergy is “not a thing of past” and stressed the bishops have to always be vigilant and be sure to not “let complacency set in” in their efforts to stop it. At a Mass as part of a “Day of Prayer and Penance” June 14 at SS. Peter and Paul Cathedral some 200 bishops heard Atlanta Archbishop Wilton D. Gregory said during his homily that “we can never say that we are sorry enough for the share that we have had in this tragedy of broken fidelity and trust” in the clergy sexual abuse crisis in the Catholic Church. Cardinal DiNardo, the principal celebrant, spoke about the pope’s call at the liturgy’s start. “In solidarity with our brother bishops around the world, we acknowledge the sins that have occurred and ask forgiveness from and healing of those who have suffered abuse at the hands of those who should have been protecting and caring for them,” he said. At the end of the Mass, the bishops, in a sign of penance, knelt while praying a prayer of healing and forgiveness for the victims of sexual abuse in the church. The spiritual life of young people also was discussed during the opening day of the assembly. Cardinal Joseph W. Tobin of Newark, New Jersey, and Archbishop Charles J. Chaput of Philadelphia opened the discussion with a presentation on the consultations and questions for the bishops to consider in preparing for the October 2018 Synod of Bishops on youth and vocations. The bishops were reminded June 15 that the historic Convocation of Catholic Leaders was nearing by Bishop Richard J. Malone of Buffalo, New York, chairman of the bishops’ Committee on Laity, Marriage, Family Life and Youth. He noted that it will be the largest gathering sponsored by U.S. bishops and will be a time to show the unity of the church. The convocation, an invitation-only event, is meant to give the 3,000 participants expected to attend a better understanding of what it means to be missionary disciples in today’s world through workshop presentations, keynote addresses and prayer. The USCCB overwhelmingly approved revisions to the guidelines governing the celebration of sacraments for people with disabilities that take into account medical and technological developments. Passed 180-1 June 14, the revisions in the “Guidelines for the Celebration of Sacraments with Persons with Disabilities” updates a document that was adopted in 1995. The guidelines were developed as a tool to improve access to the sacraments by persons with disabilities and reduce inconsistencies in pastoral practice. In other votes, the bishops approved a new translation of the “Order of Blessing the Oil of Catechumens and of the Sick and of Consecrating the Chrism,” 178-3. The ritual is used each year at diocesan chrism Masses. It will be sent to the Vatican’s Congregation for Divine Worship and the Sacraments for its “recognitio,” or final approval. However, the bishops’ approval of a collection of blessings in Spanish for use in the U.S. that complement English texts included in the “Book of Blessings” fell one vote short of reaching the threshold necessary to send it to the Vatican congregation for the recognitio. The vote on the “Bendicional: Sexta Parte” (Part VI) was 171-2, with two abstentions. Voting will be completed by mail ballot with the Latin-rite bishops who did not attending the assembly. Sean Gallagher, Natalie Hoefer and John Shaughnessy contributed to this story.